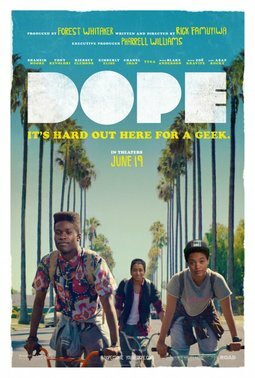 “Dope,” the Sundance Film Festival hit that will open in theaters this Friday, will be the first movie to accept digital currency to pay for tickets. According to The Wrap, beginning Monday, the film’s distributor, Open Road Films, will allow Bitcoin users to buy tickets on MovieTickets.com at more than 900 theaters in the U.S. The payment platform, GoCoin, will make the process transaction similar to a credit-card purchase. The film, directed by Rick Famuyiwa, follows Malcolm (Shameik Moore), a geek living in Los Angeles’ Inglewood section who loves 90s hip-hop and has a large knowledge about modern technology. “Bitcoin is an integral part of ‘Dope’ and we could not be more excited to bring this unique new opportunity to moviegoers,” said Open Road Chief Marketing Officer Jason Cassidy in a statement. Though you can do more with Bitcoin these day like use it to buy Microsoft apps and products, it’s still a service that’s on the fringe, as hacker Alex McGeorge points out in The Wrap story. And in an age where smaller movies like “Dope” (budgeted in the neighborhood of $1 million) have to compete against Goliaths like “Jurassic World,” that’s exactly who Open Road Films hopes will find this appealing. This entry was posted in Uncategorized and tagged Open Road Films, Rick Famuyiwa, Shameik Moore, Sundance Film Festival.